The title underestimates the show. 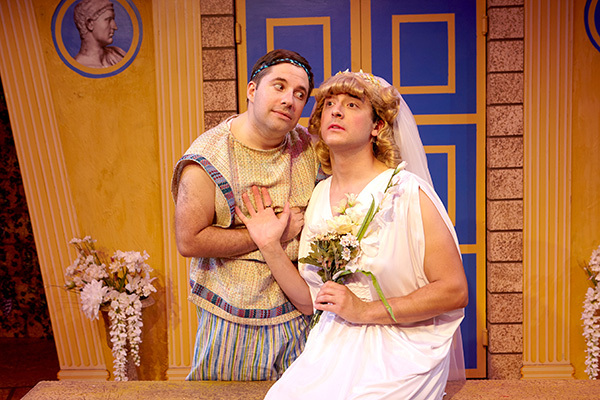 A whole lot of funny things happen in “A Funny Thing Happened on the Way to the Forum,” the 1962 winner of six Tony’s which hasn’t seen a major local production in more than a decade. 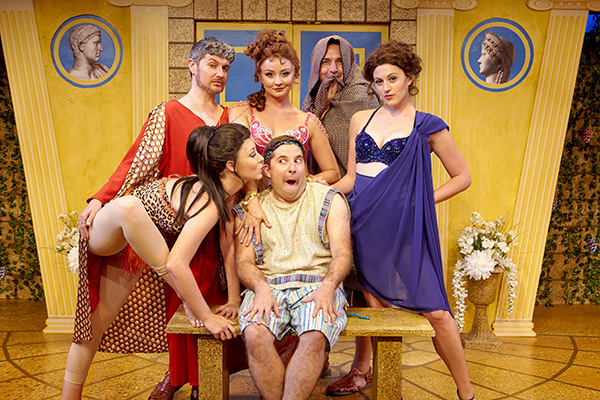 Roman writer Plautus started the whole thing with a comic play, but Stephen Sondheim (along with writers Burt Shevelove and Larry Gelbart) turned it into a musical. 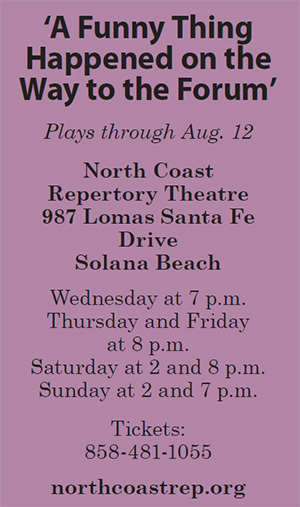 The show is now playing through Aug. 12 at North Coast Repertory Theatre, helmed by artistic director David Ellenstein, who milks it for all the considerable laughs this farce/vaudeville mashup offers, and takes it to hilarious, not-to-be-missed extremes. The action takes place in and around Mike Burnett’s three slightly off-kilter houses on a Roman street. One is a brothel run by tightwad flesh merchant Marcus Lycus (the always-funny David McBean). The second is the house of Roman senator Senex (Andrew Ableson) and Domina, his (what else?) dominating wife (Melinda Gilb). In the third lives elderly Erronius (John Greenleaf), who years ago lost his two infant children to pirates. A seer tells him he must walk around the hills of Rome seven times in order to find them, providing the show’s major running gag. But when the boy (played with adorable innocence by Chris M. Kauffmann) sees the lovely virgin Philia (Noelle Marion) in the window of Marcus’ brothel, he gets the hots for her. The problem? She’s been sold to arrogant warrior Miles Gloriosus (Jason Maddy), who is on the way to pick her up. 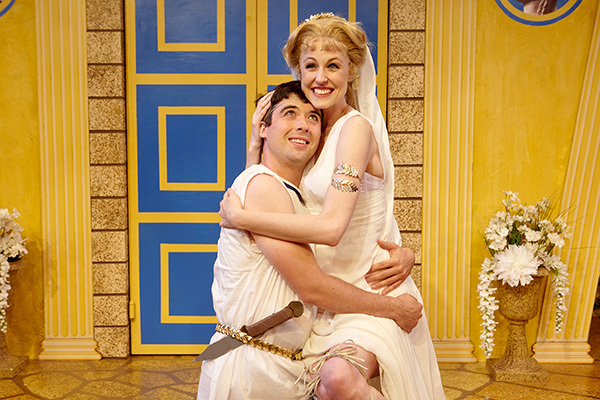 Pseudolus makes a deal with Hero, the girl for his freedom, and we’re off to the races. The complications are goofy (not to mention ludicrous), and the characters stereotypes, but who cares? They’re funny, as is the entire show, stuffed as it is with sight gags, puns, wordplay and goofy songs (this was Sondheim’s first Broadway musical). Schein, certainly one of the best physical comics in town, outdoes himself here with movement, the mugging he’s known for and some great lung power. Missy Marion, Amy Perkins and Jean Schroeder show (lovely) leg and bust some terrific dance moves as a trio of Lycus’ whores. Music Director Ron Councell’s four musicians make plenty of sound, and Elisa Benzoni’s costumes are just right. Aaron Rumley and Matt Novotny contribute fine sound and lighting, and Peter Herman’s wigs add to the comedy quotient. Leave your brain at home; this show won’t require it. 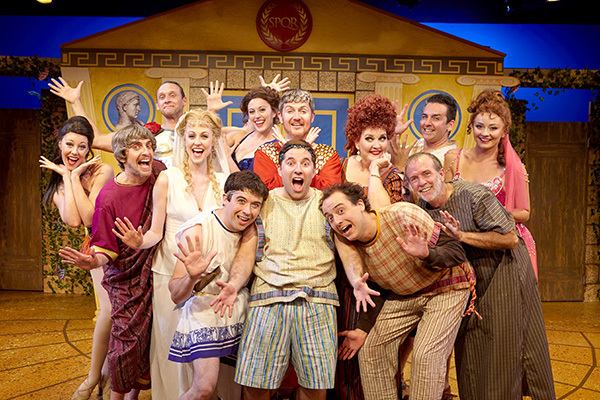 But this trip to the Forum is sure to provide giggles, guffaws, maybe even groans and send you home with a smile on your face. Tags: DowntownDowntown NewsJean LowerisonNorth Coast RepSan DiegoSan Diego Downtown NewsTheater ReviewWhen in Rome..